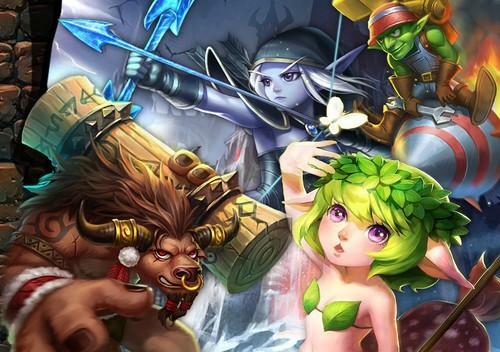 Blizzard is accusing Soul Clash, depicted above, of copying its Warcraft games. Blizzard Entertainment is taking legal action against a Chinese mobile game for allegedly copying characters and settings from its famed Warcraft franchise. On Monday, the U.S. gaming publisher claimed that Soul Clash had violated its copyright and trademark, by lifting the elements from its Warcraft and World of Warcraft games. Soul Clash, which was first published last year, features an assortment of medieval fantasy characters, including purple-colored elves, warrior pandas, and minotaurs. In Chinese, the product is called "Daota Chuanqi" an apparent play on another title from the U.S. called Dota, or Defense of the Ancients. Blizzard has decided to only take legal action in neighboring Taiwan, with the filing of a formal complaint in a local court. In an email, the company declined to comment on the case, but said it reserved the right to pursue further litigation in mainland China. Blizzard's Warcraft franchise, and other games, are popular across Asia. But China has gained a great deal of notoriety for violating copyright to create knock-off games. Even a Chinese theme park was reportedly built using characters from the Warcraft series. Soul Clash's developer, Shanghai-based Lilith Games, could not be reached for comment. But on the same day, it announced it had filed a lawsuit against a U.S. gaming developer called uCool for allegedly copying its product Soul Clash. uCool's Heroes Charge is basically a clone of Soul Clash, with identical rules, characters and a user interface, the Chinese gaming developer said in a press release. Lilith is rolling out an English version of Soul Clash to Europe, but has already brought the game to Southeast Asia and Taiwan, in addition to China.